An antioxidant-enriched moisturizer to help repair the visible effects of damaging oxidative environmental stress while minimizing fine lines and loss of elasticity. 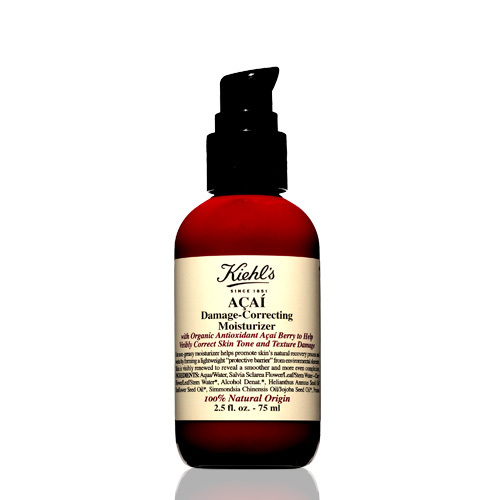 In addition, Açaí Damage-Correcting Moisturizer is formulated with 100% natural origin ingredients and 79.7% of the total formula is organic. 100% of plant ingredients are organic. The formula is also paraben and silicone free. The combination of antioxidants and essential fatty acids found in these Açaí formulas help skin to naturally renew and repair itself and prevent oxidizing free radical damage to skin cells arising from environmental and lifestyle stress. Açaí also has broad-spectrum antioxidant activity, to work on a variety of oxidants which damage skin. Other ingredients include Rosemary Essential Oils, Orange Fruit Water and Lavender Full Size: 75 ml Price: PHP 2,800 Available at: Greenbelt 5, Mall of Asia, Powerplant, TriNoma, Alabang Town Center Social Media: Facebook page: http://www.facebook.com/kiehlsmanila Grab a sample at Sample Room!